Nicole Bustamante, Tortiebaby, guerita135, Just For Fuzzies. Owes 3 members for deposits on gliders that were not delivered. Due to several health issues with Nicole's gliders, Nicole offered to refund a full deposits in private pm's on SGN and posted this promise on GC if the buyer chose to cancel due to any health concerns. 1 member canceled due to health concerns and requested a full refund of their $250 deposit back. 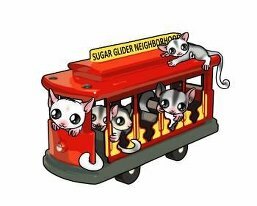 At that time Nicole reported she had spent the deposit on vet bills for her other gliders and did not have the money to give back. Nicole was told that she could pay back the deposit in pouches. Nicole said she did not have the money for fleece to make pouches but then sold pouches on eBay shortly after this. No pouches ever received but later a partial payment was made. Out of $250 this member has been paid $50, Nicole made a promise of another payment, November 15th, she did not pay. Reports she had received a payment for a glider but had too many bills to pay has reported she 'might' be able to make a payment after Christmas. Contact has been limited and non-committal. $250 deposit was made 8/19/2009, deposit requested back the beginning of October 2009, $50 received 10/30/2009, balance $200. 2 other members had to cancel their plans on buying a joey from Nicole after Nicole demanded more money upfront, changing their payment plans. Both members requested a full refund of their deposits, Nicole has admitted to having spent their deposits also. Neither member has received any of their deposits and Nicole has refused to have any additional contact with these members. Nicole has refused to open private messages from them on another board despite having logged on to that board several times now. All 3 deposits add up to $600 (still owed). Deposits were made in August and September of 2009. Owes 1 member for an order purchased and paid for but has not been delivered. (shipped Oct. 26th 2009) but package was never scanned and has never arrived. Private messages have been sent to Nicole reporting the missing package, pm's have not been opened by Nicole despite being on that board. SGN owner/Queenduck contacted Nicole by phone and email advising Nicole her package did not arrive, she had pm's unopened, and to contact that member. Nicole has refused to make any contact in approx. 3 weeks. PayPal refunded $15 to the buyer, which was the second shipping amount sent. PayPal was unable to refund the whole amount because the time limit to request a refund had expired. Order is worth approx. $175. In just a few months Nicole has collected and spent $775.00 from our members and has not provided anything in return. Alicia aka Queenduck or Sissy pouch Queen, ask me where to get them. As of today, I have been refunded 100% of the money owed to me by Nicole for a glider deposit. I have received 100.00 of what she owes me. Nicole has made a payment to one of the people she owed a deposit on. This was a large payment and per Nicole she is paid in full, per the other party $50 is still owed. It does appear that Nicole is making efforts to repay everyone she owed.